Y Bwthyn Heneglwys, self catering cottages with instant confirmed online booking. We have Self Catering throughout Anglesey , Wales . Accommodation near all the attractions, places to see and things to do.......You are able to make an instant secure confirmed online booking. We also offer Anglesey AND Wales travel and tourist information.. Traditional cottage in heart of Anglesey, great area for walking and cycling, Cefni Reservoir and plantation forest close by.. This semi-detached property, attached to the owner&rsquo;s home on a private country lane, offers small but perfectly formed holiday accommodation in the heart of Anglesey and is perfect for couples or families with young children. Located on the outskirts of Bodffordd, the property is accessed via a private lane from the A5. Llangefni, 3 miles, offers shops, pubs, cafes and art galleries, and has a twice weekly market with an arts and crafts fair once a month. A great area for cycling and walking with a public footpath running through the owner&rsquo;s grounds and close to the Cefni Reservoir and plantation forest. Beach 7 miles. Shop and restaurant 3 miles, pub 1 mile. . Ground floor: Living room. Kitchen with breakfast area and tiled floor. First floor: 2 bedrooms: 1 double leading to 1 bunk. Bathroom with shower over bath and toilet. Maximum sleeps 2 adults and 2 children.. Economy 7 central heating, electricity, bed linen and towels included. Cot and high chair on request. Freeview TV. DVD. Electric cooker. Microwave. Sitting-out area and furniture. Shared lawned garden with patio. Shared 13 acres of natural grounds. Barbecue. Parking (2 cars). Cycle store. No smoking. 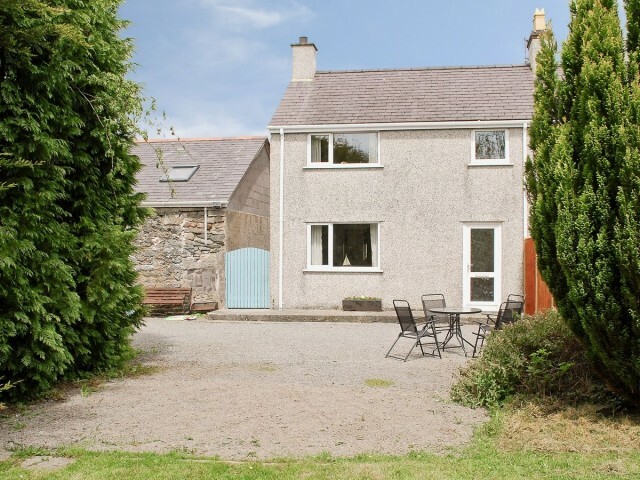 This semi-detached property, attached to the owner’s home on a private country lane, offers small but perfectly formed holiday accommodation in the heart of Anglesey and is perfect for couples or families with young children. Located on the outskirts of Bodffordd, the property is accessed via a private lane from the A5. Llangefni, 3 miles, offers shops, pubs, cafes and art galleries, and has a twice weekly market with an arts and crafts fair once a month. A great area for cycling and walking with a public footpath running through the owner’s grounds and close to the Cefni Reservoir and plantation forest. Beach 7 miles. Shop and restaurant 3 miles, pub 1 mile.